KANSAS CITY, Mo. 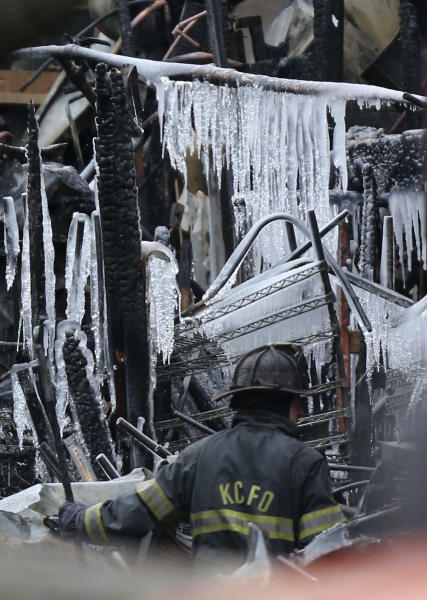 (AP) — Firefighters with cadaver dogs were searching early Wednesday through the rubble of a popular restaurant flattened by a natural gas explosion and massive fire that sent black smoke high over Kansas City's upscale Country Club Plaza shopping and dining district. 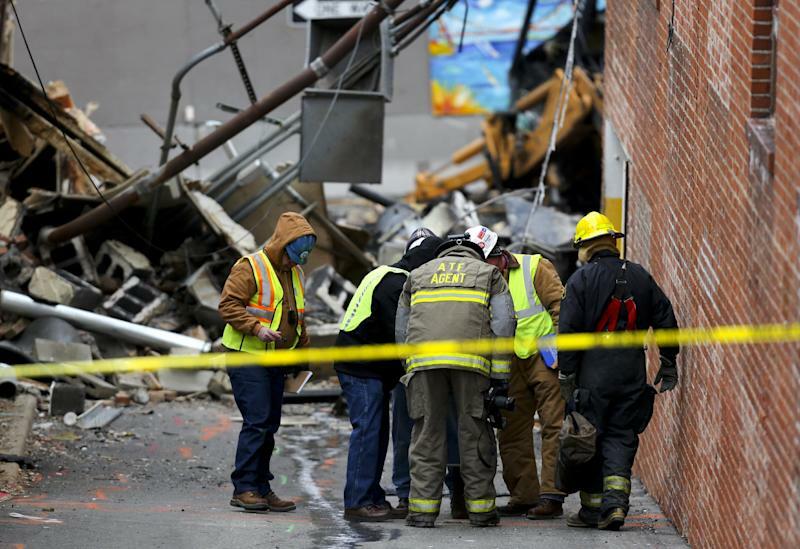 Authorities said 14 people were known to have been injured — at least three critically — by the blast and gas-fed fire that destroyed JJ's restaurant around 6 p.m. Tuesday. The flames, spectacularly reflected in the glass facade of an office building under construction across the street, died down only after crews were able to shut off the gas around 8 p.m.
Kansas City Fire Chief Paul Berardi said late Tuesday the search with trained dogs was standard given the size of the conflagration and the fact that there was no immediate, reliable count of people who were inside the intimate, one-story restaurant at the time. "I would always fear there are fatalities in a scene like this," Berardi said. Only after the search was complete — which wasn't expected until later Wednesday morning — would the site be released to investigators looking for the cause, Berardi said. Missouri Gas Energy, the utility that supplies the area, said in a statement that "early indications are that a contractor doing underground work struck a natural gas line." Berardi, however, cautioned that the cause was not yet known. "This investigation needs to be concluded before we want to speculate on any of that," he said. JJ's had managed — until Tuesday night — to survive in the shadow a large construction project that has been under way across the narrow, one-way street for seven years. 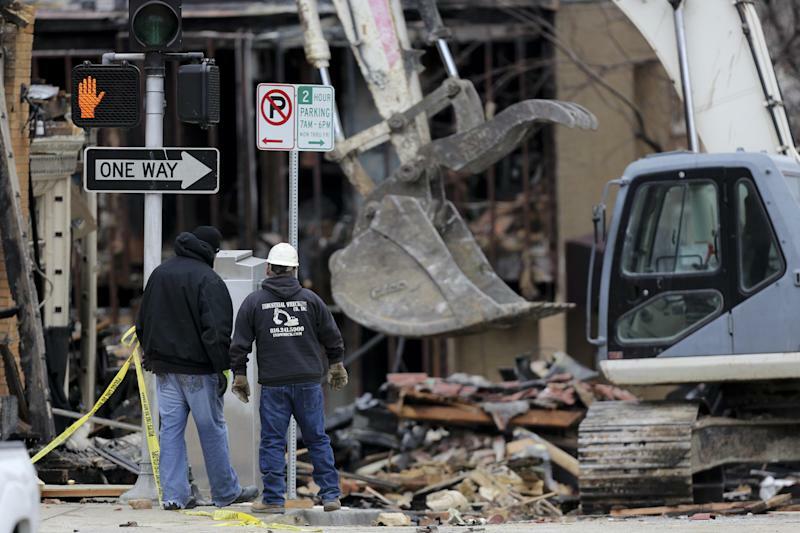 The work had complicated access to the street-corner restaurant, and a server needed hospital treatment in 2006 after she was struck by a rock sent flying by blasting for excavation of the construction site. It was not known early Wednesday whether the contractor said by Missouri Gas Energy to have been doing underground work was connected to the construction project. The University of Kansas Hospital was treating six people injured in the blast, said spokesman Bob Hallinan. He said one person was in critical condition, two were in serious condition and two others were expected to be released. He said all of those injuries were traumatic, such as broken bones, rather than burns or smoke inhalation. The final patient there was a burn victim who was transferred from Truman Medical Center, Hallinan said. Dr. Marc Larsen, medical director of the emergency room at St. Luke's Hospital, said they had treated eight people, six of whom were walk-ins with minor injuries. He said two males were in critical condition and would be kept overnight. He said one had extensive burns and the other had facial trauma. "JJ's has a small staff, a family feel," said Ligon, 45, of Kansas City, Mo. "You see the same 100 people all the time — a bar and restaurant for regulars. We're just really hoping we come out of here OK in terms of injuries." Associated Press reporters Heather Hollingsworth in Kansas City and Jeff McMurray in Chicago contributed to this report.